(Jan. 18, 2019) -- UTSA Air Force Reserve Officer Training Corps (ROTC) detachment 842 is gaining national attention. It has been named the United States Air Force (USAF) 2018 High Flight award winner, signifying the best large ROTC detachment in the region, an area spanning from Louisiana to Hawaii. UTSA’s program is recognized for its relentless focus on cadet development through deliberate training, engaging experiences and a genuine desire to invest in future leaders. 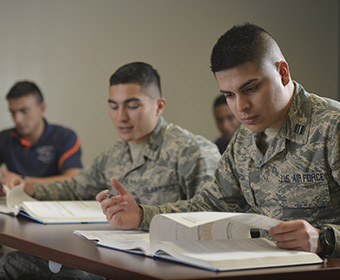 Several UTSA ROTC members also received individual honors from the USAF. Agustin Llano, the UTSA Air Force ROTC program manager, was selected as the nation’s University Employee of the Year Air Force ROTC. Two staff members were also selected for regional awards. Captain Jesse Beinhower was named Education Officer of the Year and Captain Anthony Guajardo ’11 was selected as Recruiting Officer of the Year. 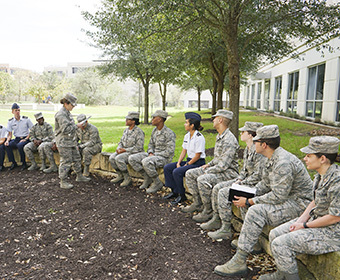 The UTSA Air Force ROTC program includes about 200 cadets, making it the second largest detachment in Texas, and one of the 20 largest in the nation. Demographically, the detachment is more diverse than the Air Force and is comprised of cadets from UTSA and six other San Antonio area colleges and universities. The detachment mission is to recruit great people, develop them into scholar-warrior leaders who take ownership and engage in partnership, then commission them as exceptional officers in the United States Air Force. The cadets go through more than 1,000 hours of career-focused training conducted through academic classes, leadership training, physical training, field training and numerous other professional development opportunities. The cadets have conducted field activities at Camp Bullis, flown in jets at Randolph Air Force Base, participated in physical training with Air Force Special Forces, and even traveled to China for specialized language training. Qualified cadets are also eligible for financial support through scholarships and stipends. This year marks the 30th anniversary of Detachment 842, which has also been named the top ROTC detachment in the nation twice over the past 10 years. Later this year, it will host a homecoming celebration to commemorate this historical milestone, and the many awards the detachment has won over the past three decades. Learn more about the UTSA Air Force ROTC Detachment 842 or call 210-458-4624.